The Madagascan Serpent-Eagle is endemic to the island. It is placed in the monotypic genus Eutriorchis. This species was believed to be extinct and was almost unknown until being recently rediscovered in 1993. It is present in the E of the island where it lives in the forest canopy in the primary forest. It is very secretive and rarely seen flying above the tree tops. In spite of its name, it takes few snakes, preferring chameleons and geckos, frogs, lemurs and possibly young birds. The Madagascan Serpent-Eagle is threatened by habitat loss through deforestation, and persecution in some areas. It is currently listed as Endangered. 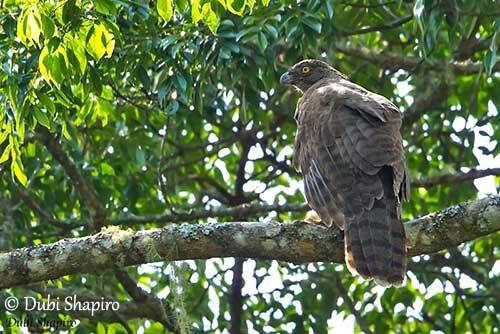 The Madagascan Serpent-Eagle adult has dark brown upperparts with dark bands, especially on scapulars. The flight-feathers are dark brown with darker bars. The long tail has six dark bars and a narrow white tip. The underparts are white with dark barring, but throat and breast are more heavily barred. On the underwings, the flight-feathers are white with narrow, dark brown bars. The brown head show narrow, white barring on neck sides. We can see a large crest when the bird is excited. The lores are feathered. The hooked bill is black with blue-grey cere covered in bristles. The eyes are yellow. The long legs and the stout feet with short, thick toes are yellow. The juvenile resembles adult. On the upperparts, mantle, coverts and rump feathers have white edges involving scaly effect. On the buffy-white underparts, the dark barring is more widely spaced. On the head, the feathers show white tips and the crest is voluminous. The eyes are blue-grey. 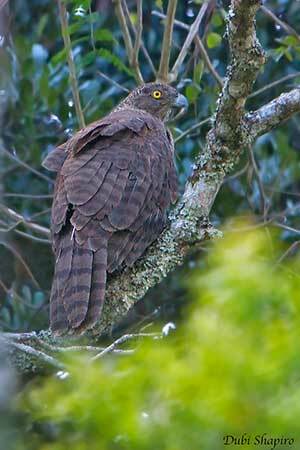 The Madagascan Serpent-Eagle is found in N and E Madagascar, S to Ranomafana National Park. The Madagascan Serpent-Eagle frequents the primary rainforest up to 1,000 metres of elevation in NE Madagascar. It rarely ventures beyond the forest edge. The Madagascan Serpent-Eagle’s call is a distinctive series of loud “wah…wah…wah…wah…” followed by a single, lower, frog-like “rugh”. The Madagascan Serpent-Eagle feeds primarily on chameleons and geckos, but it also takes lemurs, lizards, frogs and a few snakes. Bats and young birds can be occasionally taken too. It hunts below the canopy, often moving from branch to branch to catch a prey with its powerful talons. It also hunts on the forest floor. It may search into epiphytes and under the leaf litter with the feet, in order to flush some concealed prey. Nothing is known on courtship behaviour. Only some nests have been found in 1997 and 2005, and some others later. Both adults share the incubation and feed the young. The breeding territory is probably defended against intruders. The Madagascan Serpent-Eagle is sedentary on the island. It is often reluctant to fly, except when disturbed. The flight is less powerful than Henst’s Goshawk, with more floppy wingbeats. In flight, both long tail and short, rounded wings are noticeable. The first nest was found in November 1997 in Masaola Peninsula. It was placed within the canopy of the primary rainforest. Some other nests have been found later. The Madagascan Serpent-Eagle’s nest is usually made with sticks, about 20-23 metres above the ground in tree fork. However, the first nest was placed inside an epiphytic Bird’s nest Fern (Asplenium nidus), and the centre of the fern was lined with green leaves and twigs forming a rim. The female lays one or two white eggs and both adults share the incubation during at least 40 days. But the female does most of the work. The young are fed by both adults, but the male delivers about 75% of the prey items. The female begins hunting when the chicks are 18 days old. The young birds disperse when 15 weeks old. They are able to hunt themselves within ten days after fledging. The pair nests only once every one or two years. The first nests observed had only one egg, but clutches with two eggs may occur, and sometimes, both young survive. The Madagascan Serpent-Eagle is threatened by habitat destruction through forest clearance for slash-and-burn cultivation and commercial logging activities. Disturbances and human persecution are a problem in some areas. The remaining habitat is threatened by increasing human population. However, this species can be found in several protected areas and its range appears to be larger than once though. The population is roughly estimated to number 350/1,500 individuals and is decreasing. The Madagascan Serpent-Eagle is currently listed as Endangered.